On 02nd November 2018, Sagar Public school, Gandhi Nagar celebrated its Annual Function of the young cherubs with great enthusiasm and zeal. Around 1000 students from classes Nursery to IV participated wholeheartedly towards the success of the grand event. The event’s grandeur unveiled the relentless efforts of our teachers under the guidance of the Principal – Dr. Jaishree Kanwar. 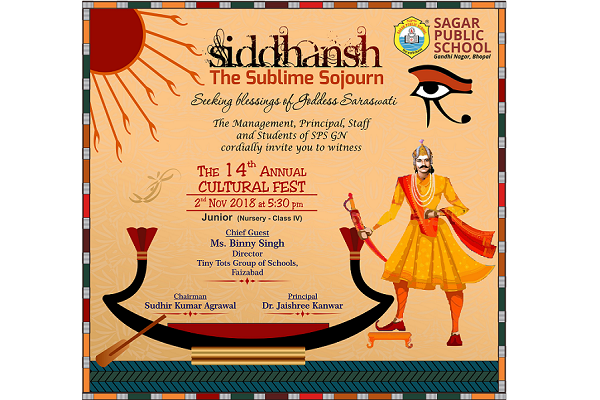 The Annual Day 2018 was woven around the theme “Siddhansh – A Sublime Sojourn” that transports you to a righteous era of King Adityavardhan, encapsulating a plethora of stories exuding a gamut of emotions and virtues like – modesty, nobility and humanitarianism. Ms. Binny Singh, Founder Director Tiny Tots Group of Schools, Faizabad was the esteemed Chief Guest for the event. The event unfolded with the lighting of the lamp and offering obeisance through Aavahan. The Journey show cased the virtuous recital of King Adityavardhan, by means of music and dances showcasing our rich Indian culture and its enriching values. The audience was in raptures seeing the “Frolicking puppets Dance and the Lyrical Humm by toddlers clad as honey bees. A three skit drama edified the audience through its flowing moral values. Dance Drama like Fortune favours the wise, the virtuous beginning and Atulyam Adityam Inspired to instill the virtues required for a meaningful life. Dr. Jaishree Kanwar extended a warm welcome to all the dignitaries and presented the annual report highlighting the achievements of the academic year 2018-19. Keeping up with our age old tradition of honouring our employees who have rendered their selfless services for almost a decade the support staff was felicitated. The vote of thanks was proposed by Ms. Shailaja Reddy Headmistress of the Pre-primary wing. The function concluded with the rendering of the School Anthem. For photos click on following links.